As some of you know, Sufferin’ Summits is a stupid idea I had 4 years ago that I’m still paying for 4 years later… It all started with a simple idea – could I create a ride like Ronde PDX – where “Ronde” means “A dance in which dancers move in a circle”, and PDX refers so a “Private Data Exchange”, a way of exchanging data without being burdened with all of the downsides of the public internet. Where was I? Oh yeah, the ride. So, anyway, I came up with the outline for a ride, and it was pretty stupid. And then I went out and rode a bunch of hills and figured out a way to make it stupider. It is simply the hilliest ride that I could cram into 55 miles, something around 9000’ of up. 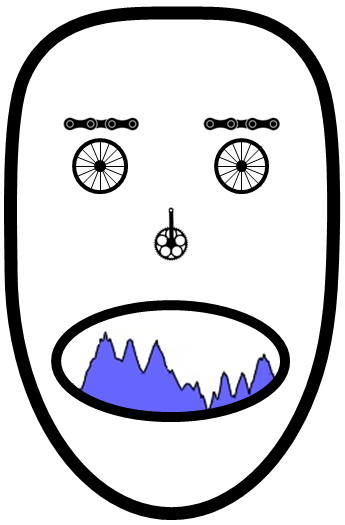 And it turns out that it’s worse than Ronde PDX, though they do have a second day (okay, so, technically, there *is* a route for the second day of Sufferin’ Summits, but I am just not quite stupid enough to publish it, let alone ride it the day after). For the first couple of years I did some light marketing of Sufferin’ Summits to the local community, but now I just kindof let it sit out there, the lesser-known, poorly behaved, and frankly less attractive cousin of Passport2Pain. I tell people that it’s because I want it to have that “underground” mystique, but the reality is that I’ve worked with people who organize big rides and I’m far too lazy to put in that much effort. So, it typically pulls in 20-30 people, and that’s just fine; I get to ride it with a few friends and look publicly stupid to the rest of the cycling population. Win win in my book. The ride is technically unsupported though my lovely wife has hosted a snax table at the halfway point the past two years. The first was that we had been treated to an extended run of “Wildfire Smoke”, and let me be clear that it was it was not the Tony-award-winning production that we had been promised. It was on hiatus Thursday night, but came back for an encore presentation the day of the ride. It was officially in the “unhealthy for sensitive groups” category, which – among other things – says that if you experience shortness of breath or unusual fatigue, you should contact your health provider. The secondary issue is that because of the crappy air quality, my training for the past few weeks has been a lot lighter than usual. I’m a fan of a nice taper in general, but two rides in two weeks is a bit extreme. Friday night, we watched the Hawks extend their perfect preseason record, and then I headed to bed. That 5:30 AM alarm was going to come soon enough. And yet, it didn’t. Because I could not get to sleep, and 2 AM found me on the living room couch, reading (“Crash Test Girl” by Mythbusters alumnus Kari Byron is pretty good, and “Year of the Cow” (Stone) is a fun mix of history, science, and cookbook). So, anyway, I got off the couch at 5AM and then proceeded to not make my usual breakfast of bacon, eggs, and berries, because I typically do these rides (mostly) fasted. My food bag has one Honey Stinger “waffle” (mostly emergency carbs), a small bag of cheez-its, and a small bag of extra mixed nuts (that’s what you get if you take mixed nuts and add more nuts, right?). One water bottle has water, the second gets a serving of Biosteel hydration powder mixed into it, which I’ve been experimenting with for electrolytes recently. You know that it’s good because a) it has Calcareous Marine Algae and 2) the “mixed berry” flavor I have tastes remarkably like the cough syrup my parents gave me when I was a kid. On the way out I mix up two scoops of SuperStarch with half a scoop of endurox in a failed bid to make it more palatable; two scoops of highly educated cornstarch in a glass of water tastes exactly like what you think it does. Oh, and I grab 12.5 macadamia nuts and eat them on the way out of the door because macadamia nuts. The ride starts at a park in Issaquah, and I expect that the smoke is going to affect the turnout. We end up with 13 of us at the start, which is a few more than I expected. I ask how many people are doing the ride for the first time and then give a quick pre-ride briefing, which mostly consists of an assertion that while experience would lead one to expect that the first half of the ride is worse than the second half, experience would, in this case, be a poor guide. Did I mention it was cold? Two years ago we started at 9 AM and it was 95 degrees when we finished, so the official (which only means “ride with Eric until you get tired of his slow pace”…) start is now 7AM, and it’s 54 degrees out right now. That is a great temperature for climbing but a crappy one for descending; you will still be sweaty at the top. I’m wearing a jersey (*not* my Sufferin’ Summits jersey) and shorts, plus arm warmers and a vest. We spin out of the starting point across Issaquah, to the first climb, Grand Ridge. Grand Ridge is really a warmup, it’s mostly not that hard. On the first climb, the fast group rides ahead, and I expect not to see them for the rest of the day. We head through the “Little Red Riding Hood” forest path, where the part of the wolf is ably portrayed by two short but nasty 20% climbs near the top of the section. Eventually we top out, and are rewarded by a non-existent view. We’re up around 1000’ now, and on a decent day you can see Bellevue, Seattle, and the Olympics, but we can’t even really see our next climb. My descent karma fails and I get stuck behind a car driving 5 miles under the speed limit, but eventually we get on the main drag and descend down into Issaquah proper. Squak Mountain is next. The bottom half has a series of rollers where the steep parts are 16% or so, then we turn onto the top section. I’m climbing okay, and looking at my stats, it took me 11:05 to climb the 940’ of the main climb. That’s only about a minute over my PR, so, pretty good. The data shows I climbed at 760 meters (2500’) per hour, also decent, though my legs are only feeling average. We top out there, avoid incidents on the sharp turns of the descent, and ride over to Telus. We go up the Telus North climb, which hits about 18% immediately, eases a bit in the middle, flattens out in the neighborhoods, has a mercifully short 24% (!) section, and then finally tops out. It’s only about 450’ total, thankfully, but it gets my attention. We head to the other end of the development, pick up a few more feet of vertical, and then descend back down. This time it’s a Hyundai driving 18 MPH in a 25 zone. Which brings us to hill #4, Zoo hill. In previous years the route has used a convoluted route to pick up a particularly nasty climb, but I’ve switched back to the classic climb. The very bottom part is newly repaved but the crappy middle part is still it’s crappy self, the rollers are still soul-sucking, and the climb to the water tank and radio towers is its usual cantankerous self. My legs really don’t feel very good on this part, but Strava says that I pulled a PR on it by 44 seconds on the lower 2/3 of the climb. I am skeptical, given that I’m only pushing 200 watts and my heart rate is about 20 beats below my max. I’m spending a little time tacking back and forth across the hill because my legs feel weak. There’s no reason to take pictures at the top because you cannot see a damn thing, and I get cold as soon as we stop. I do note that the smoke hasn’t really been that much of an issue; it seems that once we get above the first 200-300 feet, the air is a bit cleaner. We descend down, climb up Pinnacles, descend a bit more, climb up Belvedere, and then head down and up a short and easy hill to get to Lewis Creek Park. My lovely wife is waiting there with snax, I mix another bottle of blue steel and eat a few nuts. Then it’s off to hill 5. Which is really a side hill that we will climb 3 times. We start on “The Widowmaker”, which is really nasty 494’ climb; it starts at 18%, flattens a bit, and then has a full 300’ of 20% or more. At the worst, I’m riding 3MPH and 44 RPM and pushing 275 watts. It’s the “Coffin Corner” of climbs; I can’t really slow down without falling over and if I push harder I’ll burn my legs worse and may run out of aerobic capacity (ref. “Falling over”). After 10 minutes and 28 seconds of enjoyment, I top out, meet the rest of the group waiting for me, and we descend. Only to repeat the pattern; we ride up the West Summit climb, descend, ride up a short unnamed hill, then finally up the Summit climb to the top. I’m in little danger of setting PRs on these, but I am climbing at over 800 meters per hour (10.9 fathoms/moment), which is okay. My legs are really tired; not hurting, but really tired. As we reach the top of the climb, we get a change in the weather; the smoke blows away and we can see the top of the smoke across the whole region. Glorious. Not really, we still can’t see a damn thing. What really happens is it starts to rain. And I whine about my legs, though technically speaking I’ve been doing that for the last hour, so that’s not a new thing. I make some noise about maybe being done so that the other riders with me have an “out” to quit without losing face. I pull out my stuffable vest, put it on (you probably figured that part out on your own), and we start the descent. It’s a nice 500’ descent on a mostly straight road with mostly good pavement, but a fast cold descent with wet pavement is not my preference. Protagonist (me): Guys, my legs are cooked and I’m too cold. I’m going to bail and ride back to the start before it gets any wetter. Antagonist: My legs are cramping and I don’t have a jacket. I’ll ride back with you. Non Sequitur: Guys, there’s a car behind us. We should move out of the way. Antithesis: I’m going to head down and do at least one more hill. Consonance: I’ll join you as long as it doesn’t get too wet. So, we split into two groups, and Mike and I spend 10 minutes getting cold and getting back to the starting point. Are you an insider or and outsider to the culture of this ride report? What did the author want me to get out of this ride report? How would the ride report be perceived in its own time period? What text – exact words, phrases, or passages – causes in you a strong emotional response? Eric uses: Specialized Roubaix expert, S-Works shoes, Pioneer power meter, Garmin 705 GPS, Pearl Izumi shorts, Giro helmet/gloves, and a random assortment of jerseys he’s picked up over the years.